Last week I kicked off my summer with a quick trip to Nashville with one of my best friends from high school. We joke that we basically just ate our way through the city… but honestly there were too many good places we wanted to try! First off, we went to our Airbnb to drop off our stuff. We found a cute little one bedroom spot that was within 15 minutes of everything we wanted to do. It was great because we were not planning to go downtown every day, so we wanted to stay in a location that would still be close but not right downtown. This is a glimpse of the Airbnb we stayed in. It was a great location, clean and cute, and the hosts were great! 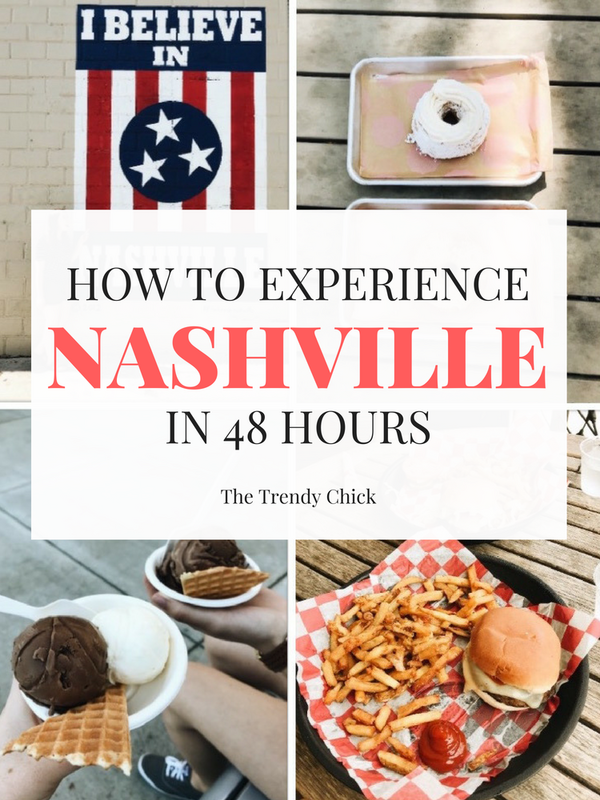 If you are looking to go to Nashville I will link it here so you can check it out and see if it would work for you too. It was also an affordable option, which was huge for us college students! Also, if you have never booked through Airbnb before, you can get $40 off your first trip by having a friend who already has an account refer you! I know most people know about this, but it is worth mentioning again because it saved us $40! After we dropped off our stuff, we headed out to Radnor Lake to walk around after the long car ride. It was pretty cloudy when we got there and even sprinkling off and on, but it was still so pretty! After the park we headed over to Brentwood so my friend could show me where she lived last fall when she went to school there for a semester. We grabbed dinner at a Mexican place called Chile Burrito and then headed to Jeni’s. Neither of us had ever been, but it was definitely worth the hype and I was excited to find out that there are locations in other cities too! I got Savannah Buttermint and Dark Chocolate Truffle and they were both delicious! We then walked around a few of the shops there and headed back for the night. The next day was our day to go downtown. We had to stop in at Biscuit Love for breakfast and try the famous bonuts that everyone raves about. These were also worth the hype! The bonuts (or biscuit donuts) themselves were warm and delicious, but the lemon mascarpone and blueberry compote was what made them even better! While we were in the gulch we went around the corner to the famous wings mural too! Next we went to the Pedestrian Bridge to get this great view of the city and snap some pictures. Then we went to sit on the steps shown in this picture to people watch and enjoy the day. Then we decided to get lunch at Acme Feed & Seed because you can eat on the rooftop! There was a good view, and the food was pretty good too! Personally, I loved the fries but thought the burger was just okay. But the rooftop was great so I would definitely still go back. If you do go, just know you order your food downstairs at the counter, and then once they bring it out you can carry it up to the rooftop yourself. We had to ask an employee how that worked since we were unsure if we could take our food up! Next we drove to East Nashville to The Soda Parlor. I had originally wanted to get the waffles with ice cream since that is a popular item they serve, but we just settled on splitting a milkshake since we were both so full from lunch! This is a great picture spot since they have a lit up sign and the milkshakes are fancy and cute. And while the milkshake itself was good, I did not think it was worth the price. If I went back I would definitely try the waffles instead! Then Tuesday afternoon it started pouring rain so we went back to our Airbnb to relax for a little bit. For dinner, we had to try some Hattie B’s, but we still were not that hungry so we just split some chicken tenders and fries. We also got it to go because it was still rainy and Hattie B’s was very crowded! We opted for the mild chicken, and it was really good. If you like spicy things, I have heard great things about the spicy chicken, but neither of us are a fan of spicy things so we stuck with mild. On Wednesday we headed to 12 South to checkout Five Daughters Bakery. They are famous for their 100 Layer Donut, which is a croissant donut that takes 3 days to make. I honestly wish I could have tried like 5 different kinds because they all looked great, but I ended up with a maple glazed one that was SO GOOD. They are all filled with cream in the middle that makes them even better! And the outside of the bakery is just too cute too! Love the colors and the outdoor seating was great. They also have a neon sign inside, which can be great for pictures too! They also had a Parent Trap donut which I thought was so fun, especially since it was peanut butter and cookies and cream! But since I am not a big peanut butter fan I skipped it and got the maple instead! Finally we ended with walking down 12 South to the I Believe In Nashville mural. There was nobody there when we went which was awesome since sometimes there can be a line for pictures at different murals in Nashville! Have you been to Nashville? What is your favorite thing to do there? Share in the comments!